Cabinet des Modes will begin tomorrow (assuming you read this on the night that I'm posting it). I'm excited! I'm going to post about the amazing experience I had this weekend - it was a party! And Susan de Guardiola was there and so I danced a whole lot! - but I have no pictures to share yet, so I'll just do some dress talk. My plan to make a second version of the bodice of my Cranford dress succeeded: I worked on it most of Saturday, and in the end I had one that was longer and less too-big than the original. (Too long - I think I cut it so it would be right if I did a hem like a normal person, but for whatever reason I only turned it down once. Why?) The darts are still a bit off, the armscyes are too big, and even after I'd cut pieces smaller while making them anew they were still too big. I only fixed that issue by turning down the center back edges quite far, and while it doesn't look bad, in the extant piece I took the pattern from, the curving side back seams don't form an extreme diamond, but rather are quite far from the closure at the bottom. So who knows how I will fix that. What next? I know I did a "what I want to sew in 2014" post already, but that was done without having any idea of what might come in 2014 beyond the party, so now I've had some more time to think about it. It's now more "need" rather than "think might be good". 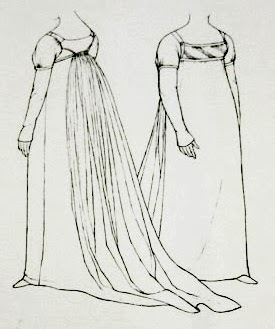 Julie and I both agreed that Regency dresses are a necessity of life. The trouble is, which to make? The past three outfits I've made have been based on patterns I've taken, which is partly that I'm impressed with myself, but it's also that examining the extant gown gives me a better understanding of how the garment works and having the photographs of it to refer back to is extremely helpful when it comes to some note I wrote that I can't translate. So my preference is to continue with this. I do have one relevant pattern of my own - the original is this and the one time I tried it I ended up with this. There's many a slip twixt cup and lip. On the bright side, because I have essentially a big mock-up and I know where I went wrong (I widened it from the center front for reasons that even now make no sense to me, and, of course, my ever-present issue: I made the back too damned wide; this is not even mentioning the whole issue with the fabric), using this pattern again would probably lead to a fairly satisfactory result that I might not fiddle with constantly. However, there's also pattern 38 in the Cut of Women's Clothes. I didn't fully make it up, but I did use the basic bodice parts (minus the sleeves) to make a gown for Clermont. So I do already have some experience with it! With all the gathering, it's not too difficult to fit. Since I didn't really wear it, I don't have as much of an idea of what would need to be improved, but I do think I made the armscyes too small and could lengthen the shoulder straps a bit. On the other hand, based on the illustration I think it's probably late 1820s and not 1816-19 (the date given). But what I would really like to do is the ca. 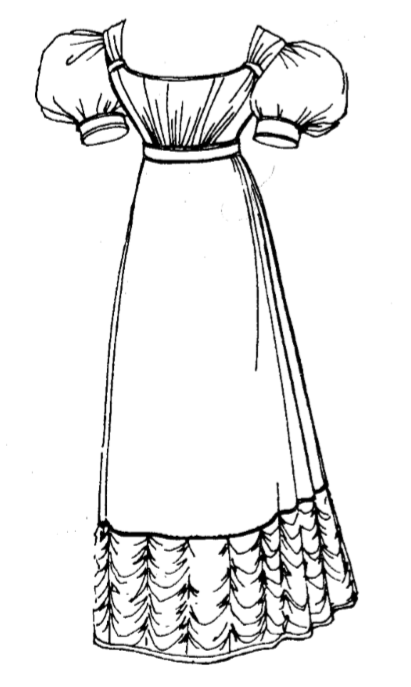 1805 gown from Patterns of Fashion I pictured high above. It's earlier in the period (technically not even in the period), which suits my knowledge and experience, and it has a front closure with the bib/apron, which suits my love of convenience. But I've never even attempted this a smidge, and even when I make mock-ups something always seems to go very wrong in my fitting process. Well, while I ponder this, I also have a plan to make some serious muslins. I'm just tired of scrambling every time I start a project, having to rush and, as a result, messing up my cutting in some way or not spending long enough on the fitting. So I came up with the idea of sitting down and making single-sleeved muslins of some basic bodice types, to spend more time fitting them so that when I suddenly need to make eg. a late bustle gown I'm already set. Unfortunately, I know I'm going to be making some better corsets, so they won't be exactly right, but they'll be closer to my (eventual) shape than the unaltered, scaled down versions. Sleeve muslins to have ready? Brilliant idea.